Today I am sharing one of my favorite companies with you, Annie Griffin Collection. The brand was created by two creative sisters Annie Griffin and Robin Gerber. They design darling clothing with colorful prints and cherry colors. The Resort 2012 Collection is full of fun, retro inspired clothing that I surely will be wearing this Spring. And maybe you too! 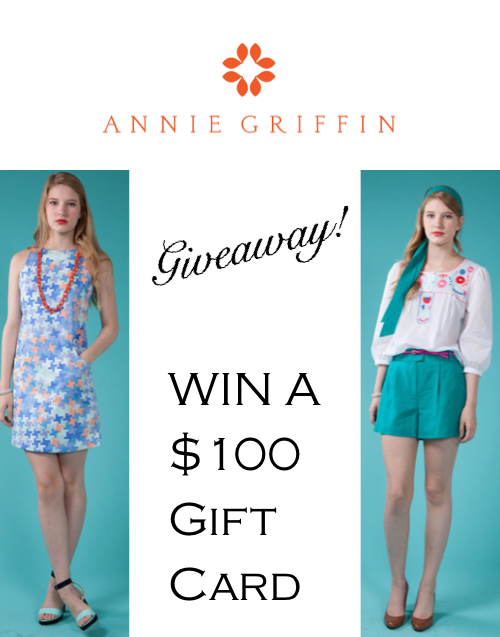 One of you will have the chance to win an $100 Gift Certificate to Annie Griffin! Leave a comment with your email and telling me your favorite trend for Spring 2013. Good Luck and a winner will be chosen by January 19th! My email is frilot.maitland@gmail.com and my favorite spring trend is graphic prints in bold colors! I recently got a j crew schoolboy blazer and I would love to have something that really pops underneath! I love your blog, and can't wait to read more! Hey Sloane!!! my email is graceywallace@yahoo.com and I love the lavender trend I am seeing now. It's perfect paired with anything navy and goes great with gold. A perfect spring outfit for me would be white jeans, a lavender silk shirt, and a navy cardigan and platinum jack rogers!! My email is ehn410@gmail.com. I am looking forward to summer 2013 and J.Crew's collection of pastels, prints, and neons. I saw a preview during fashion week and it's to die for! Awesome giveaway! My email is catiescott@verizon.net :) Hope I win!! My favorite trend would definitely be emerald jewelry. I've seen it everywhere lately and I just bought the cutest emerald necklace - an awesome change from my usual gold jewelry! Done Done & Done! I'm such a sucker for pastels in Spring, so I'm looking forward to whipping out hues of mint, lavender, and pink! I love all of the pastels! This is a great giveaway! My email is garison.keel@gmail.com. Sorry that I entered late and I couldnt do the following stuff because I dont have a facebook or twitter.